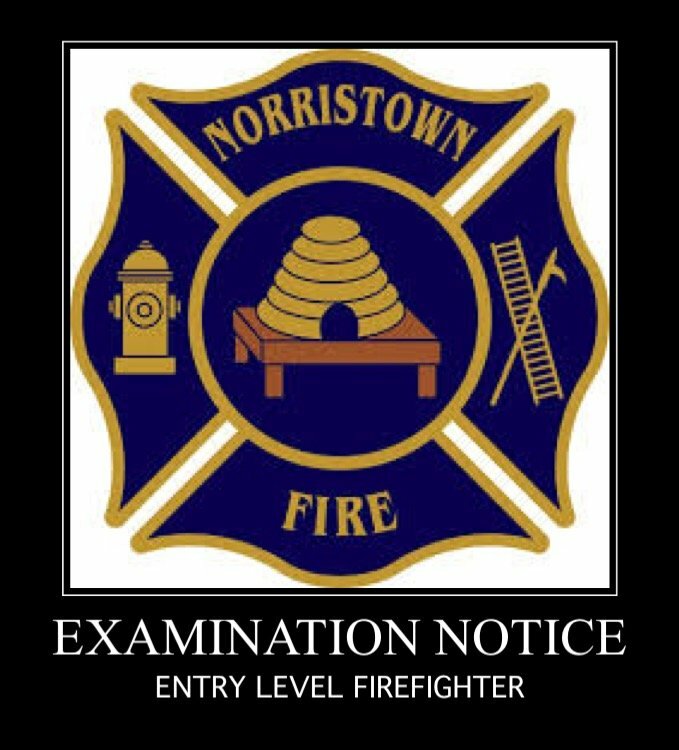 Applications for the position of ENTRY-LEVEL FIREFIGHTER for the Municipality of Norristown, a Civil Service position, will be available beginning April 1, 2019 at the Office of the Municipal Administrator, Norristown Municipal Hall, 235 E. Airy Street, Norristown, PA 19401. Applications may be picked up on that date between 9 a.m. and 4 p.m. and thereafter during regular business hours between 9:00 a.m. and 4:00 p.m., Monday through Friday. COMPLETED APPLICATIONS MUST BE SUBMITTED TO THE MUNICIPAL ADMINISTRATOR’S OFFICE at the above address PRIOR TO 3:00 P.M. on May 21, 2019. Completed Applications must be accompanied by payment in the amount of $35 to cover the administrative cost of testing. Payment is by check only, made payable to “Municipality of Norristown,” and is non-refundable. Every applicant for any position in the Fire Department must: (1) possess a diploma from an accredited high school or a graduate equivalency diploma; (2) be a United States citizen, (3) be 21 years of age by May 21, 2019; (4) be physically and mentally fit to perform the full duties of a firefighter (5) prior to appointment, possess a valid motor vehicle operator’s license issued by the Commonwealth of Pennsylvania; (6) be a Pennsylvania State Certified Level II Firefighter or equivalent and have an issued certification number in accordance with the National Fire Protection Association (NFPA) 1001 consensus standards (PROOF MUST BE PROVIDED); (7) must possess current certificates (either the full course within the last 12 months, or a refresher course within the last 12 months for Hazardous Materials Operation) from an approved training facility for Hazardous Materials Operations in accordance with the NFPA 472 consensus standards (PROOF MUST BE PROVIDED), (8) Emergency Vehicle Operations Course – Fire Apparatus or equivalent (PROOF MUST BE PROVIDED, and (9) Pump Operations Course (PROOF MUST BE PROVIDED). Fire Fighter 1 – “Essentials of Fire Fighting,” IFSTA, Sixth Edition. Hazmat Operations – “Hazardous Materials Awareness and Operations,” Jones and Bartlett, Second Edition. Driver Operator Pumper – “Pumping and Aerial Apparatus Driver/Operator Handbook,” IFSTA, Third Edition. Other mandatory components of the complete testing process are an oral examination, physical agility testing, background check, and medical and psychological examinations. The Municipality of Norristown is an Equal Opportunity Employer. If you require any special accommodation in accordance with the Americans With Disabilities Act to complete the testing, please provide evidence of such recognized disability to the Municipal Administrator at the time the application is submitted. Any questions, please contact the Norristown Civil Service Commission Attorney Karen Lee DeMerlis, Esq., at 215.633.1890, or by email at: kdemerlis@rudolphclarke.com.